Everything we do in the commerce world is executed with the goal of simplifying the purchase process. In other words, the faster a retailer (or B2B seller) can get a customer to convert, the more revenue that business takes in. The buy button technology that has been developed recently within the commerce world is gaining steam precisely for this reason. Brands have a vested interest in inserting direct-to-purchase links within organic dialogues across social media and other channels. Twitter, Facebook and Pinterest have all recently taken on this trend. 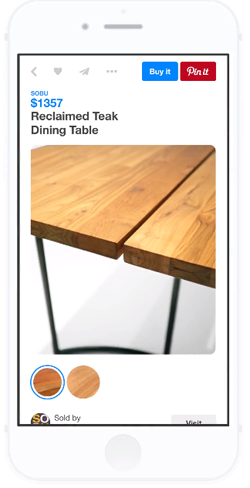 Pinterest, the most recent to take the leap, is now home to more than 60 million pins that allow consumers to directly purchase the item featured (see image). The idea is that when consumers notice a product within the context of the information they’re consuming, they’re more likely to make an immediate purchase —especially if they can make that purchase with one click. This trend makes sense in a mobile-driven world. Smartphone users will avoid switching apps as much as possible, so most shoppers would welcome a way to make a purchase without leaving their current app. While the idea of contextual buying (or buy buttons) applies very clearly to the B2C world, the concept works well for B2B commerce too. Business shoppers are ultimately consumers too and prefer a streamlined, personalized buying experience. The traditional online buying experience requires shoppers to seek out a site, navigate a digital catalog, find the intended product and then complete the checkout. This can be a lengthy process that often leads to abandoned shopping carts along the way. Unless consumers are dedicated to making a purchase, they will lose interest if they’re forced to complete too many steps. Buy buttons cut out most of the middle steps by providing a link for immediate purchase. Furthermore, these links are strategically placed within relevant, organic conversations on social media. This allows consumers to immediately purchase something that is currently on their minds without switching apps, windows or screens. Ultimately, the ease of which buy buttons can create transaction opportunities amidst relevant dialog or content streams motivates seamless transactions to happen more efficiently. For B2B brands, contextual selling creates an opportunity to insert personal interactions back into the sales process. The legacy processes of the B2B world involved sales forces making in-person sales with business customers, and these sales were a direct result of personalized conversations. While they lacked the convenience of today’s digital sales portals, face-to-face interactions forced sales reps to talk through the nuances of products, demonstrate new lines and simply provide background information that customers often fail to seek out on their own. But as we’ve evolved toward an online experience, we’ve taken away the dialog between sales reps and customers. While the benefits of digital commerce far outweigh those of traditional face-to-face selling, we are left with a static environment void of human interaction. Ultimately, in today’s digitally driven world B2B customers are in need of education and more personalized conversations during the sales process. This could be a representative engaging on a digital channel or through a community of people who have a common interest around the industry or product. The good news is that most online sales portals and CRM platforms provide a channel for these interactions to take place. With increased dialog across digital channels, B2B brands can then create an opportunity for contextual selling like we’ve seen in the B2C world. But for B2B brands, the buy button, or contextual selling, is likely to look a bit different. The social media buy button relies entirely on an organic social media conversation. So if a customer is talking about a pair of shoes, he or she is presented with a link to purchase shoes immediately. In other words, it’s just an actionable ad. The brand really knows nothing more about this customer other than the fact the he or she is currently talking about shoes online. B2B brands, however, can go much deeper. With the use of advanced CRM systems like Salesforce, brands know more about each customer’s previous purchase history as well as relevant industry trends so they can make more personalized recommendations. For B2B, contextual selling would be a richer customer experience that offers a personalized sales process. For example, a consumer packaged goods brand could use analytics to recommend orders based on current conversations while also factoring in that customer’s most recent order, the location of the business and other industry trends. Business buyers are not likely to make an impulse purchase from a new brand, but would likely be interested in adjusting orders if it meant they would remain competitive in the industry. Contextual selling is an opportune venue for this because it allows brands to make tailored recommendations to business buyers based on what they are discussing in the moment. And the way in which B2B brands rely on advanced CRM technology allows for this degree of personalization. By providing communities (through online portals or CRM platforms) that allow for customer-to-customer or customer-to-brand conversations, B2B brands can create an opportunity for contextual selling. This idea takes advantage of the benefits of both legacy face-to-face sales interactions and online portals by allowing for personal conversations but also the ease of digital buying. If it’s done right, contextual selling can lead to increased revenue, greater customer satisfaction and ultimately more profitability for B2B brands. Chris is the CEO of CloudCraze, as well as the co-founder and partner at digital consultancy firm Avionos and investment group, Aktion Partners. He also co-founded Acquity Group, now part of Accenture Interactive.